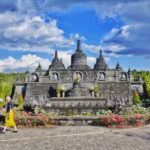 Brahma Vihara Arama is a beautiful monastery and the largest Buddhist Temple in Bali with numerous meditation rooms, libraries, beautiful gardens, and an impressive mini replica of the world’s largest Buddhist archaeological site, Borobudur on its highest grounds. This place is better known as Banjar Buddhist Temple because of its location in Banjar Village, Buleleng. 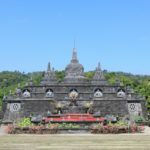 This monastery is located in the hill of Tegeha area, Banjar Subdistrict, 22 kilometers west of Singaraja and 11 kilometers from Lovina. 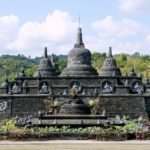 Meanwhile, from Denpasar, this monastery is about 100 kilometers that can be reached in approximately 2.5 – 3 hours through the Denpasar-Bedugul-Singaraja. 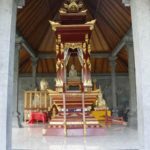 In addition to Buddhist worship places, this temple is also a place to meditate. When you are facing to the north, then you will mesmerize with the beautiful scenery of the North Bali Sea, plantation area, and rice paddies from altitude. This monastery only has a small amount of Buddhist appearance with colorful decorations. It has very Balinese decorative carvings and doorman with bright orange roofs and Buddha statues. The beautiful structure is located in a location with views of the valley and across rice fields to the sea. Tall pine trees, pruned grass, well-maintained flower gardens and high altitudes all add to the sense of peace that you can enjoy here. 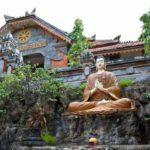 The quiet and calm atmosphere and the direct view of the sea make this Buddhist temple become a perfect place of meditation and definitely worth a visit. Its artistic and unique building is also a special attraction for tourists. Brahma Vihara Arama was founded in 1969 on an area of approximately 4 hectares and was completed one year later. In 1973 this new building was inaugurated as the main Buddhist temple. Previously it was already standing a monastery located in the Banjar Hot Springs Bathing, but at that time his followers (upcaka) is still very limited so that Brahma Vihara Arama is seen as a more viable place. Brahma Vihara Arama consists of three words: Brahma, Vihara, and Arama. Brahma means praise/glory. Vihara means the way of life, and Arama means place. 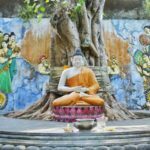 From the combination of words, it can be concluded that the meaning of Brahmavihara-Arama is a place for self-training, forging the noble/laudable behavior which in Buddhism includes Metta, Karuna, Mudita, and Upekkha.